Congratulations! You have officially survived your first full weekend without saintly voting. Veterans of this online devotion know well the desperate void that comes during the weekends of Lent, which is why there is even an official diagnosis for this phenomenon: Lent Madness Withdrawal (aka LMW). This is precisely why the Supreme Executive Committee, in its infinite pastoral sensitivity, shared 10 Tips to Surviving LMW. So, while we may all dread the effects of yet another weekend filled with LMW, in the meantime we have a full five days of saintly bliss stretching out before us! We begin today with Columba taking on Kateri Tekakwitha, a well-known saint vs. one perhaps new to many. Away we go! Born in 521 CE to Fedlimid and Eithne in what is now County Donegal, Ireland, Columba was privileged to receive a first-rate education. His first studies were with Saint Finnian. Then he went to study at Clonard Abbey, and from this base, Columba and other missionaries traveled around Ireland to set up other monasteries that became famous, including ones at Kells, Derry, and Swords. In 560, trouble struck. Columba ran afoul of his superiors in the monastery over a psalter. Columba adored books, and upon discovering a gorgeous copy of the psalms, decided to make a copy for himself in secret. Saint Finnian objected to this. Behold, the first recorded copyright dispute in monastic publishing! The argument escalated until there resulted an actual pitched battle known as the Battle of Cul Dreimhe, in Sligo. Many monks were killed. Soon after, Columba ran afoul of the king. A neighboring royal, Prince Curnan of Connaught, fatally wounded the king’s relative in a hunting accident. Prince Curnan was a cousin to Columba, and he sought sanctuary at the abbey from the angry king. The king, however, ignored this long-honored custom, stormed the abbey, and killed the prince. 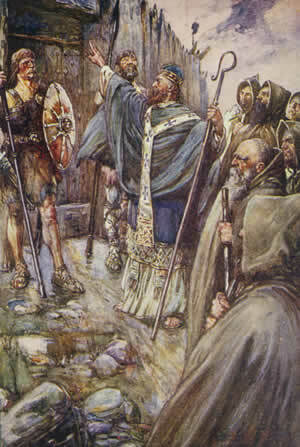 Infuriated, Columba summoned his clan (Clan Niall, of the bloody Nine Hostages-fame) and urged them to rebel against the king. Many died, including several brother-monks, and Columba realized his life had taken a wrong turn. As penance, he agreed to exile himself. He sailed away, landing at the island of Iona in 563. There, he built a monastery, which has become a famous and oft-traveled site for pilgrimages. From Iona, Columba launched many missionary journeys into Scotland, establishing churches and monasteries as far away as Aberdeen and Inverness. According to legend, Columba even preached to and converted the Loch Ness monster. He died in 597, at home at Iona. According to his biographer, Columba’s last act was to put down the manuscript he had been copying, after he wrote out, “They that love the Lord shall lack no good thing,” and he remarked, “I must stop here. Let Baithain do the rest.” And so, he died—a book lover to the end. O God, by the preaching of your blessed servant Columba you caused the light of the Gospel to shine in Scotland: Grant, we pray, that, having his life and labors in remembrance, we may show forth our thankfulness to you by following the example of his zeal and patience; through Jesus Christ our Lord, who lives and reigns with you and the Holy Spirit, one God, for ever and ever. Amen. Born in 1656 near Auriesville, New York, Kateri Tekakwitha was the daughter of a Mohawk chief and a Roman Catholic Algonquin woman. Named Tekakwitha, which means, “She who bumps into things,” she had a childhood bout with smallpox that left her with permanent facial scars and diminished eyesight. Known as the Lily of the Mohawks and the Flower of the Algonquians, Tekakwitha was among the first Native Americans canonized by the Roman Catholic Church. Her life changed in 1675 when she met Jesuit Father Jacques de Lambertville. She sought an education in Christianity, and she converted to the Roman Catholic faith and was baptized on Easter Day in 1676. She took the name Kateri for Saint Catherine of Sienna and declared a lifelong vow of virginity. Tekakwitha’s family continued to shun her: first for her disfigurement, and then for her adherence to Christianity. In 1677 she took up residence at the Jesuit mission just south of Montreal. There, she prayed tirelessly for the conversion of her people and undertook many forms of penance in the development of her personal piety. Although she didn’t have access to formalized convent life or instruction regarding holy orders, she and her mentor, Anastasia, her close friend, Marie-Therese, and several other young women committed to practicing their faith together as a community. On Wednesday, April17, 1680, at twenty-four-years-old, Kateri Tekakwitha died during Holy Week. She is believed to have uttered as her last words, “Jesus, Mary, I love you.” It was reported that in death, her smallpox scars disappeared. The cause for her sainthood was initiated in 1884, by Roman Catholics living in Canada. Pope Benedict XVI canonized her on October 21, 2012. Four US shrines honor Tekakwitha, and numerous churches, schools, and institutions are named for her in the United States and Canada. God of grace and glory, your beauty fills the whole of creation, calling lilies to bloom and mountains to bow. Thank you for the life of Kateri Tekakwitha, the Lily of the Mohawks, who was called to live a life set apart, devoted to penitence and prayer. Create in us a willingness to examine our hearts and be transformed by your love. Amen. At 11:02 p.m. EST, two addresses in Vermillion, SD and Medford, OR were blocked. 125 votes for Kateri Tekakwitha were recorded from these two locations, and we do not know of groups participating in Lent Madness in those cities. Not enough votes were cast to affect the outcome, but we have blocked the addresses to prevent further votes. At this point, no votes have been removed from the total cast. Unless we hear from those folks, we will subtract the appropriate number of votes if needed to keep the outcome as determined by fair voting. Remember, vote once only per person! 268 Comments to "Columba vs. Kateri Tekakwitha"
As much as the Celt in me would like to support Columba – especially given how his name has been tracked through the mud of late by the Churches of England and Scotland! – I can never resist backing the Canadian Content. Living across the river from her shrine at Kahnawake, it’s gotta be Kateri (GA-DA-LI) for me. I voted for Columba. He started a rebellion, settled on an island, made a monastery, and did many other things. Overall, in my opinion, he is just epic. zachary i voted for Kateri Te;kakwitha because people made fun of her because of her scars and she stood up for herself. When Columba copid a book against his “Boss’s” orders, he sure got my vote! The idea! Right on!! I voted for Columba because he got kicked out of his country and had his own island. Our splendid succinct Oliver. Prompt and to the point…someone to count on! Oliver you have a gift! I am starting to look forward to your comments every day as much as I look forward to reading about the saints themselves, Oliver! Oliver, I think I am in love with you. It’s a wonderful place to visit, Oliver; I’ve even there twice. Be sure to put it on your bucket list. Oliver, I like the way you think. Thank you for making Lent Madness so much fun!! I love your reason, Oliver. You see right to the point. I agree … it’s Columba. Oliver, I look forward to your insightful vote every morning. You are a bright young man. Keep up the great work. I chose the devout woman over the warring monk. But he repented, so he was no longer the warring monk. I totally agree with Nora and voted the same way. I’m with Pat, Nora and Reid. I voted for Kateri Tekakwitha. Agree with Nora and the other Kateri supporters! Personal discovery over testosterone acting out. I have visited Kateri’s shrine in Fonda, N.Y., on the Mohawk River. I noticed many devotees place medallions and amulets around the neck of her statue, asking her protection for soldiers in combat and healing for relatives. I believe Leonard Cohen has composed a song in her honor. I have to admit that neither of these raised a great deal of excitement in me, so I voted for my fellow Upstate New Yorker, Kateri. I agree…not much excitement for me in these two. I also voted for Kateri. I had planned to vote for Columba before reading about the battles he instigated where monks were killed. I went for the gentle spirited Kateri instead. Me, too, Patsy. I had no idea Columba was involved in violence! I voted as you did, Patsy. Although the king’s offense — disregarding the custom of the times of allowing those fleeing the king or officers of the law to go to a church and claim sanctuary — was not a minor thing, the direct involvement in battle of a monk bothers me. So, even though he repented (and even though I have Scottish ancestry), I voted for the gentle and much abused Kateri. The thing these two saints have in common is seeking the conversion of an entire people. We need more men in this world renouncing their life of violence. Columba got my vote. Exactly. Columba’s is a story of repentance and redemption in a pretty big way! I like the simple story of a child of God, rejected by her own people, who found comfort and meaning in the message of Christ. It is in our small communities that we lift each other up and are often healed from our sorrows. So, it is Kateri for me. And it bothered me greatly that Columba’s disputes led to bloodshed and death. Ellen, yep, my thoughts exactly, but I couldn’t express it as well as you did. Hmm. I guess repentance means nothing? Columba lived the greater part of his life proclaiming peace. I suppose that doesn’t account for much nowadays. Anyone who can preach to and convert the Loch Ness monster gets my vote. While Columba made mistakes, he had the humility to turn his life around. The monastary he founded after repenting impacted many people. Columba loved the Lord so much that he wrote out psalms and died writing out other books. I voted for Columba because of his ability to change his life, his love of books, and his love of sea monsters. You said it beautifully! I’ve been really torn, but–“she who bumps into things” and the Loch Ness monster conversion best exemplify what Lent Madness is all about! And her name reminds me of one of my favorite opera singers–Kiri Te Kanawa! Well said Olivia. I would like to add that those who truly repent and turn their lives around are often able to provide understanding and light for others. Also it is a relief to know that Nessie is a faithful monster of the deep. My vote is for Kateri, Lily of the Mohawks, who chose a path of peace. While I admire Kateri and usually favor the saints recognized among the Native peoples of North/Sputh America, I spent a week on the holy island of Iona. Walking in Columba’s footsteps I came to understand what is meant by ‘a thin place’. Columba’s repentance that brought him to Iona and then he carried the message of Christ’s love to Scotland leaving a legacy that inspires prayer, witness, and social justice action throughout the world even today with the Iona Community. Going with the “doer” today. that should be South America! Had to go with Columba. My pilgrimages to Iona have deepened my faith and love for Celtic Christianity. Kateri Tekakwitha kept the faith in her short life despite all odds…a shining example for us to follow. And who can resist a saint whose name means “she who bumps into things?” It’s Blessed Kateri for me! The beautiful isle of Iona has become a n international Christian community for prayer and solidarity in faith. It is not a space belonging to any one denomination but to all who seek to have a living faith. Columba’s penance was to leave his beloved and lush Ireland for a desolately beautiful, but not lush, island in Scotland. Not to ignore the violence, but to look to the end results I voted for Columba, over my fellow Canadian. As a member of the Iona Community I can do nothing else but vote for Columba who in penance left his land and established the monastery at Iona from which the north of Britain was evangelized. In the prayer for the present day community members remember Columba for his gifts of courage, faith and cheerfulness. There is a beautiful legend that as Columba’s death drew near, his white horse, sought Columba out and rested his head against Columba’s chest weeping in sorrow. and new ways found to touch the lives of all. still to be a sanctuary and a light. Having spent time at the Abbey two Easters ago, I had to vote for Columba. I can still close my eyes, see the crashing waves, feel the wailing wind and recall the great Spirit I felt during my days there. Columba for me! Columba had me at Irish book lover. I’m additionally impressed by his ability to see the error of his ways and to accept a life of exile. While I might be put off by the bloodiness of his disputes, I also look at that in the context of the times in which he lived. I could not have said it better. Columba repented of his war like actions which brought suffering, so I can overlook that- his love of books are what I find resonant. As one who seems to always bump into things, I identify. With 2 nieces taking Kateri as confirmation name, had to vote for her. Besides, her shrine in Fonda NY is tended by Franciscans. Columba renounced his anger and his need for revenge and changed his life, making a difference in the world by his actions and his prayers. Had to pick him. Thank you, Ellen. I agree. Columba did great things later in life and is well known but I’m really tired of all the roaring around and bloodshed (even in the name of publishing) that went on then and goes on now–even though a lot of the bloodshed is just verbal. Kateri quietly did the things we should all be doing. I had to read the bios twice today to arrive at a choice, and when I clicked the results button, the early voting was tied, so maybe I’m not the only one ambivalating. I chose Columba because a) he worked hard at his faith; b) he messed up; c) he recognized that he messed up and tried to make up for it. Also, I think his story would make a ripping PBS mini-series (“Game of Monks,” starring Benedict Cumberbatch). Here here….,Love your miniseries idea! But “Here, here” means it will be shown on our local PBS stations! Like Francis of Assisi, Columba lived very less-than-perfect life, and the grace of redemption was obtained through renunciation. Although the violence was disturbing, I’ll go with the lover of books, Columba. Kateri is my choice for today. She chose to follow Jesus in a quiet life. She suffered rejection by her own people because of her devotion. She is a good example of the Christian Way. Columba’s love for the written word and his final rejection and repentance of violence is also a great example for living the Christian life. In the end I chose kateri for today. I went with Columba for his ability to fall off the rails (as we all do) and recognize the need to change course. His devotion to books and connection to Scotland also speak to me. I’m not convinced all those Irish battle stories are true, and others say Culumba was banished. But I was ready to vote for Kateri, but couldn’t find enough that she did. So I went with the doer, Columba. On the other hand, what might Kateri have done if she’d lived longer? Her life as a Christian was only four years. He converted Nessie??? Gotta vote for Columba. It doesn’t seem right that Kateri’s family shunned her even more after her conversion to Christianity, when her own mother was Roman Catholic. She did indeed lead a saintly life in spite of (or perhaps because of) the difficulties she was dealt. However my vote goes to Columba. There are not many of us who have not rejoiced at least once in our lives as our tribe rained down some death dealing terror in our own wars with other clans. We all need to see the error of our ways, repent, and follow the way of peace. Columba and his isle have been an inspiration to so many over the centuries. Her mother was not Mohawk but an Algonquin captive – her father, mother and brother all died from the small pox that disfigured her. She was raised by an uncle who probably didn’t accept her faith. It can be hard to be a girl and woman in this world. Props to Kateri! 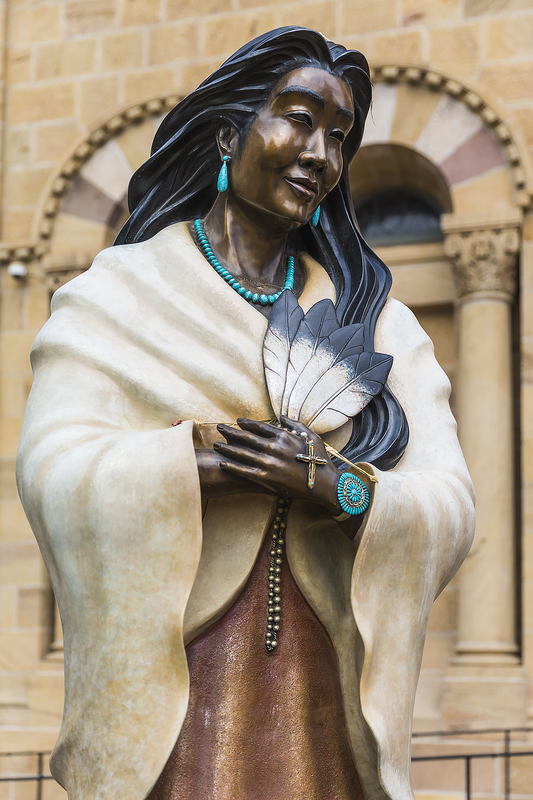 I was delighted to see the photo of Kateri’s statue that stands in front of the Cathedral of St. Francis in Santa Fe. I have seen it in person many times. Like so many other saints, Columba led a less than perfect life. He was human, after all. He repented. The is more in that which is biblical, to my mind, than many would seem to recognize while fixated on the warring. Columba for me, although it was a tough choice. However, the Irish half of my ancestry identifies with him. We often do things in anger and regret them a minute after. And, of course, I can understand the love of books and learning! Irish monasticism, and Scottish roots, I am voting for Kateri, as I live down the street from a parish dedicated to the North American martyrs, and there is a beautiful statue of Kateri-of-blessed- memory there that I visit on my daily constitutional. As a calligrapher and book lover, I had to vote for Columba. And he did repent his warlike ways, which is a good example for people — OK, for me — when smacking someone with a sword sounds like a good idea! And preaching to Nessie? Wow! I’ve never met a book I didn’t want to take home. The Katerie statue is beautiful and Columba — well he was Irish, so what more can I say? I had to go with Columba–he’s my favorite saint, thanks to his musical, poetic, and soul-friend gifts. This particular contest reminded me of another voting opportunity going on around the U.S. right now. . . Does anyone know why the Roman Catholics canonized Kateri? Not having that information, I voted for Columba. I left my heart in Iona on my first visit to Scotland in 2007 – Columba for me! Columba is the classic prodigal son. He strayed and caused loss and grief as a result. He also recognized his errors and set about correcting them. Kateri was like the older brother; she didn’t stray and remained true to God’s ways. However, while Columba went on to accomplish much to help other people, it’s not clear to me that Kateri did the same, other than prayers (and I won’t gainsay the power of prayer). So, I’m going with Columba. Frankly, I don’t see either as a Golden Halo winner. I had planned to vote for Columba, having fallen in love with Iona and all things Celtic. But the more I thought about, the more I realized that Kateri overcame even more formidable odds to follow Christ. Besides, Columba has already achieved great fame in the Christian world and probably doesn’t need more, whereas she could use a bit more! So I voted for her. Converting the Loch Ness Monster made me a convert. A vote for the Irish and Scots and their wonderful, colorful, earthy legends. So glad to know the Loch Ness monster is Christian! Is there an up to date bracket? For those of us who miss a day and want to see “real time” coverage of the brackets. Thanks. I went with the underdog in this battle, though it was almost like a coin toss. For the times, becoming a Christian and modeling a life of prayer and devotion, Kateri showed great strength of character in remaining steadfast in the face of being shunned from her people. The fact that she established a small community to practice her faith shows she was a doer…and may have done other acts of piety in a quiet way. Columba already has a great following, and I understand Iona is indeed a powerful thin place that I hope to visit one day. I’m surprised that Kateri is losing here. The only thing Columba has going for him as far as I’m concerned is converting the Loch Ness Monster. Other than that, he seems to be a most selfish and disagreeable fellow. I’m voting for Kateri for her humble devotion (and because she’s Canadian! My mother was born in Victoria, B.C.). It seems that many are stuck with our societies biggest flaw; the inability to forgive. A perpetrators worth is only equal to the wrong they have done, no matter what level of repentance and restitution they attempt to make. I voted for Kateri. Her short life was full of misery. Being disfigured and shunned by her people for accepting Christ would have been hard for anyone much less a young woman. Sure Columba did advance the church, however he did some naughty things . He copied a book that he knew he wasn’t supposed to. He certainly didn’t turn the other cheek. Less Nessie and more Good Deeds would have impressed me more in his case. I voted for Columbo not only because I had a college classmate who actually lived on Iona with her husband, but also because I purchased prints from the Book of Kells when I visited Ireland in the 1960’s. I would like to ask the Lent Maddness community for prayers. Yesterday three international students at my university we hit and killed by a drunk driver while changing a flat tire while driving home from visiting friends at nearby schools over the weekend. Another is in the hospital, and three more are physically unharmed by watched this all happen in front of them. Please pray for our community as we try and make sense of what happened. I am sorry for your community’s loss, and my heart goes out to the families who are receiving notifications that no parent should ever have to hear, that their child has died far from home. Prayers are being offered for your community. Yes, prayers. Every parent who sends their child abroad lives in fear of such things. I am so very sorry to hear about this tragedy. So sorry for this terrible tragedy. I will certainly pray for you. This is indeed a tragedy, and I offer prayers for the families and loved ones who suffer this terrible loss, and for those who are suffering physically and emotionally. May God’s presence be felt and bring peace and healing. Lifting up prayers for you and your community. May the peace which surpasses our human understanding come to you, your community, and the families of the students to heal what has been broken. I’m so glad you took the opportunity to address this community in this way. Lent Madness is fun, but community is a deeper thing. My prayers are certainly with you, all the others at your university who are suffering, and the bereaved families. May all of you receive the powerful consolation of the Holy Spirit. My closest friend is a graduate of your university. We were shocked and saddened by this news, and will pray for your community and the students and family involved. Doubly difficult for the families, since the students came from so far away. Prayers indeed from all of us at Lent Madness. Praying for the students, their families and the whole university community. Prayers for your community and especially for the students and their families. Sorry I pushed reply too soon – I agree with Heidi who likes men who repent for their violence, but I vote for Kateri who suffered for many injustices and yet knew God was with her helping others. She who bumps into things ought to be allowed to bump along to the next round! Thanks for sharing her story with us. I wanted to vote for Kateri for all the politically correct reasons and because I’m not physically attractive. But, because I often take wrong turns with my life and have made many course corrections, and because I’m a sucker for Celtic spirituality, I voted for Columba who saw his mistakes, repented and did his best to serve God. I’m glad Columba finally got it right, but he caused a bit too much damage along the way for me. As a rule, I don’t cast my vote for a contestant whose name I can’t pronounce, but I’ve got to give this one to the quiet piety of Kateri Tekakwitha. Although I am from upstate NY and know about Kateri, my vote goes to Columba. Did he write the lovely melody for The King of Love My Shepherd Is? I think I’ll always side with the one who does something with their imperfect human existence something to help others keep from making the same mistakes. While Kateri is a good role model I had to vote Columba just for his impact on later generations. Her scars disappeared upon her death! What a wonderful demonstration of God’s healing power! Kateri gets my vote. My mother discovered Iona shortly after my brother’s unexpected death at age 15. She traveled there often and eventually, with her husband, founded an ecumenical rest house there, Duncraig. Her favorite spot was Columba’s Cove, where she believed that he spoke to her once in Latin as she was grieving. We were blessed to be able to scatter her ashes there. Columba’s experience feels too political to me. Friends and relatives in high places both helped and hurt him. I went with Kateri, who lived a brief but faith-driven life. In a time when many Christians are causing great damage in the name of defending the faith, Columba’s recognition of the wrong he had caused and willingness to do penance and exile himself gave me hope that maybe Christians today might repent of warring on each other and change their ways. Also, I’m of Scottish descent. Also, Loch Ness Monster. I voted for Columba. You had me at “Columba adored books.” (Actually, you had me at Donegal, but loving a book so much that he would do an unauthorized borrow sealed the deal.) I looked up Patron Saint of Bibliophiles and got nothing. All the responses involved patrons of people who had some hand in producing or selling books. I could find no saint to look after those of us afflicted with this (often happy) disorder. Unless there is someone I overlooked, I would like to nominate Columba for this post. I’m all about the do-ers, so it’s Columba for me. Being shunned is one of the most hurtful punishments one has to endure. Disfigurement scars and poor eyesight are hard to deal with 24/7 and when one professes the Christian faith, no matter the denomination, only God can be your ultimate salvation. Columba is indeed a well-known Christian figure who underwent many hardships, self-initiated in some instances, and paid dearly, but I favored the lesser known Kateri in hopes more LENT MADNESS devotees will know more of her devotion to the Christian faith. Good blogging today…clogging, too, if you’re up to it ! While I love Iona and its atmosphere of prayer (and thank Columba for his holy exile), I voted for Kateri. To continue to love in the midst of rejection and loss is a monumental thing for any of us. Her example is far more meaningful to me in the small ways I live my life. I understood Kateri to be the first Native American woman canonized. The photo above is of the beautiful statue of her here in Santa Fe, NM, in front of the Basilica of St. Francis. We have an icon of her on our home altar and find great joy in her love of nature, people and God. Anyone who converts Nessy has my vote. St. Columba for this Scottish lady. Of course I voted for the book lover! Having spent 33 years in a church of St Aidan of Lindisfarne, I’m partial to Celtic Christianity, but Ireland sure went downhill after Patrick, didn’t it? Them Irish is a feisty lot–need some lessons on saintly behavior. But Columba made up for it on Iona. “Converted the Loch Ness monster”? Come on, that’s stretching things a bit, even for hagiography. That was probably made up by somebody who got into the Irish whiskey. I wish the description for Kateri provided above for the voting was complete. She has a significance far beyond her Catholic faith. She is the patroness of ecology and nature. She showed the importance of letting spirituality infuse all aspects of life, with the core principles and values of walking and living in a sacred manner, knowing that all spaces are sacred. “Such a world view acknowledges the Creator. We can celebrate that,” she said. I took this quote by Saint Kateri from an article written by Juana Magel Dixon, The National Congress of American Indians. Both are saints. Kateri was canonized in 2012. I religious tradition, I read, reasoned, prayed. The I voted for Columba because Ionia is such a great place. I voted for Kateri. I believe we are closer to God when in the presence of a child. They have no influences from the big world they live in, other than their parents and small circle of relatives and friends. Their small acts of goodness, purity and insight come directly from their hearts and souls. I think Kateri, despite her hardships, showed Christ’s light in the way she handled her situation. So many children are brought into the world, by God, into unloving, bad situations, and God finds a way for them to prevail in life and even influence their small world in a good way. Let’s see, Columba is the name of Jeb’s wife. So do I support him because I am a Floridian? Or do I support Kateri? In this day and age, Muslims who convert to Christianity face much the same rejection as Kateri. Their families will have nothing more to do with them. Maybe Kateri can give them strength and support as they endure some of what she had to endure. Kateri had everything against her, yet she found peace and comfort in the Lord. I did, but I don’t really understand what that’s about and what they want me to do. Please get me back on Lent Madness. I’ve learned so much on your web site. the same thing has happened to me and I have the same problems. I hope we can both get back onto the list. I just wanted the comment notifications to stop, they were filling my inbox. Sorry that’s happened! We don’t manage this piece of the puzzle — that’s word press. You can always resubmit your email and hopefully that will fix the problem. If nothing else, you can simply visit http://www.lentmadness.org each day to vote. Ooops Ionia is a town in Michigan. Iona is a saintly place. Well, I have to vote for Columba. I have the immense joy of going to Iona most every summer for a few weeks and his spirit is still deeply felt on that holy island. The Chapel at Bishop’s House, the Scottish Episcopal Church’s retreat center, is named after this saint of the church. He almost single-handedly brought the faith of Christ to the whole of Scotland and northern England and is an inspiration to so many. Columba all the way! Just replying to myself because for some reason I have not been getting any posts. While I think the legend that Columba converted the Loch Ness Monster is pretty cool and I respect him for recognizing and repenting for his violent ways, I immediately identified with Kateri as soon as I read her name means “she who bumps into things,” as this could easily be my name. My dad used to jokingly refer to me as “Grace” (as in “get it Grace” during my clumsy moments); therefore, my vote today is for Kateri just because her story reminded me of a happy memory with my late father. Also, I would like to draw attention to Nolan’s prayer request listed above. What a horrible tragedy to lose 3 students in this manner. I will join in praying for their families and classmates. If you’d like to read good historical fiction on Columba’s life, try The Chronicles of Iona by Paula de Fougerolles–two of the proposed 3 volumes: Exile and Prophet are written. Island-Pilgrim has not been published. Men of a certain age who grew up Roman Catholic in upstate New York may recall Camp Tekakwitha, on the shore of Lake Luzerne in the Adirondaks. It was run by the RC Diocese of Albany. It was here that I first learned about Kateri Tekakwitha long before there was any talk of canonization. So despite my Irish heritage I went with Kateri. I am drawn to Columba because of his love of books, because he and his brethren spread the word of the Gospel far and wide, and because there were times during the Dark Ages when the religious houses in Europe were almost the only places where people knew how to read and write and the communities kept literacy and learning alive. However, our city (Santa Clarita, California) has four Catholic churches: Queen of Angels, Our Lady of Perpetual Help, St. Clare’s, and St. Kateri Tekakwitha. Since Our Lady is not eligible for the Golden Halo, I confess to a hope that Clare and Kateri will make it to the final countdown. I am not sure if the SEC was aware of this coincidence, that two of the 32 nominees are patrons of neighboring parishes, but we have certainly taken note of it. Kateri to go on! St. Columba converted my rough, lawless ancestors, and Nessie to boot. Had to go with him since he preceded the wonderful clerics of today in leading me to Christianity. He gets my vote. Besides, virginity is highly over-rated. This was a tough one for me. I sure have had many struggles with publishers, and felt kin to Columba thusly, but had to go with someone who was shunned but kept the faith. It is tough enough dealing with invisible illnesses. Columba is my favorite – my maternal great-grandparents came form Iona, so I’m biased as can be. Although the ability to convert the Loch Ness Monster is an impressive accomplishment, I had to vote for Kateri Tekawitha. A beautiful stained glass window of her is in my childhood church to this day and many times I gazed up at her as a child wondering what her story was. Now I know and my sentimental side had to go with her. A hard choice, but my feminist sentiments rule and I voted for Kateri Tekakwitha, a peaceful, prayerful and humble holy woman. This vote, like some of the others, is a hard one. Who doesn’t love a monk who loves books. But I have to vote for Kateri. A young woman who followed her faith and heart, even with family disapproval. She is so pure. However, I am a young woman discerning what it means to be called to “lead a life set apart, devoted to penitence and prayer”, without familial support. That line in the collect moved me to tears, which is no small feat. Therefore, I give thanks for Columba and Kateri and cast my vote for the latter. From what I have read about Iona, I revere a place that is so “thin,” that is, close to God. However, I was so pleased to know that someone from the native peoples of our country was canonized and then to learn more about her, I voted for Kateri. While Columba repented of his wicked and evil ways, that is exactly what he should have done. Had his decisions been more from the heart(Spirit)and not the head(human), I might have considered a vote for him. My vote goes to a First Nations person that suffered for her faith; Kateri Tekakwitha. May have to flip a coin, since both saints have convincing defenders. Thanks go to Megan Castellan and Neva Rae Fox for shedding light on two very interesting people. Not understanding either Irish or Scots Gaelic, I was unable to evaluate Columba’s last words and so voted for Kateri. I am a Gallagher, the clan which served as the household cavalry for Clan O’Neil, so I must choose Columba. Additionally, I am a book lover, and — personally — his renunciation of violence and re-committal to his monastic vows resonates more than his evangelism. Scotland, Ireland, holy islands and books?! I had to vote for Columba! Given I have my own little Kateri Rose (2 1/2 months old) I just have to vote for her Patroness! Iona is one of the holiest places on the planet, alive with the spirit of the Dove of the Church, Columcille. And the ruins of Durrow breathe peace in the woodlands. Columba, hands down, no contest! While I find much about Columba’s tale repugnant, and I do feel drawn to stand by my native sister … I am disinclined to vote for folks who did little more than shut themselves up somewhere and pray. As lovely an example as that is… I have to go with the Battling Bibliophile. All this time I thought Columba was a woman, so I voted for Kateri. How could I *not* vote for Kateri?!? I belong to the St. Catherine of Siena chapter of the Order of the Daughters of the King (Diocese of Chicago) and I am the living embodiment of “”She who bumps into things.” Kateri may become my new patron saint! I am live-in caregiver for my mother who’s in the last stages of Alzheimer’s Disease. What this disease does is really pretty monstrous. So I voted for Columba knowing full well that the story of Nessie’s conversion is as mythical as Nessie herself, but it’s resonating with me this morning. Most days I know I would vote for Kateri. Today it’s about books, forgiveness, and changing monsters. I fondly remember the 1985 conference of the Association of Diocesan Liturgy and Music Commissions (ADLMC) which was held at Assisi Heights (convent) in Rochester, MN. One of the most welcoming meeting rooms was the Tekawitha Lounge. I have to vote for Kateri. My vote goes to Columba, a fellow bibliophile. Also, people who err and sin, realize it and repent, are close to Jesus’ heart. The story of his horse’s love for him was icing on the cake. I’m glad to know more about Kateri, but voted for Columba. It is hard to look honestly at one’s actions and the harms they have caused, much less repent and choose a new path. Man, I can appreciate someone being named for their clumsiness. Kateri gets my vote in solidarity. I voted for Columba. Our family (on my mom’s maternal side) is from a very small island off the west coast of Scotland….Colonsay and its tiny neighbor Oransay. Legend has it that Columba first landed on Colonsay and began to establish his church on Oransay….but on a clear day he could see Ireland and it was a dad distraction, so he left and moved to Iona. We stayed on Colonsay for 4 days back in the mid 1980s….very strong ancestral vibes, very strong sense of the wildness of nature! Fresh oysters for starters, gathered at Oransay. If Kateri and Columba could have conceived a child, she or he would have certainly won the Golden Halo. Nessy would have been only the first of many monsters to convert. I think I decided on Columba as soon as I read that he was a book lover (like me). I loved the part about converting the Loch Ness monster, and I was happy that he changed his violent ways. Also, my grandson announced last week that he was picking Columba as his patron saint for Confirmation. I guess this just had to be. Once again a great bio changed my mind! And hey, anyone who converts ol’ Nessy is holy in my book! It’s a vote for Columba today! This is terribly unfair! To pit these two scions, one of French-Canada (Vive le Quebec libre!) and the other from Iona……we should just have these two the final two. My two cents. Thank you so much for sharing this link. Beautiful, lush singing. Worshipping at Iona was a highlight of my trip to Scotland years ago, and Columba’s feast day is my birthday. This was the toughest vote yet, because I could relate to Kateri too, but I went with Columba. P.S. My prayers are with the families of the students Nolan mentioned in an earlier post. Having spent many very happy times at Camp Tekakwitha as a child, I was drawn to Kateri and to her story. I alss found a thin place at that camp- perhaps because it was named in honor of a saint. She got my vote! Book lover that I am, and knowing that Colomba straightened up and flew right, he was still a bit too wild and wooly for me. Dater Tekawitha gets my vote today. Peace over war wins out! St. Columba for me. I grew up in the St Columba parish in Chester, NY and have many wonderful memories. Would have been nice if the nuns taught us about Columba being a book lover and a Nessie tracker! Many Canadians sat up and took notice of the canonization of our first Canadian saint, a First Nations woman, in October 2012. Almost exactly one year later I travelled from home in British Columbia to Montreal where a group of us were guests at the synod of our companion Diocese of Montreal. Before and after the synod weekend we were taken to places of interest in and around Montreal including the Shrine of Blessed Kateri Tekakwitha at St. Francis-Xavier Church in the First Nations community of Kahnawake, a short drive out of the city. The visit to the church and its attached museum was a highlight for me. Although we claim her as Canadian it is important to remember that she spent most of her life in New York State with only her last 5 years in Canada that began with her conversion to Christianity and her devotion to God and the Church. Of special note is that she is the fourth Native North American to be venerated in the Roman Catholic Church and the first to be canonized. Well, sort of: there was no “New York state” at the time, of course. The province of New York was smaller than the current territory of the state, and parts of what are now Western and Upstate NY did indeed fall within Canada. Ste Kateri wasn’t crossing a border when she migrated: indeed the Mohawk, who in fact consider themselves neither Canadian or American, do not recognize the border that cuts through their territory. Kateri Tekakwitha. Any saint who is the focal point of a Leonard Cohen novel (“Beautiful Losers”) gets my vote. All I can say is that I like Lent Madness far better than the 2016 Presidential primary elections. So far, I could vote for every saint we have read about for the Golden Halo. Today, it is a tough choice but I have to go with Columba. I read some more information on him, and learned that after the fight with the king a hermit monk convinced him to head for Scotland and to convert at least as many souls as were lost in the rebellion. Of course, he converted and saved far more than that in Scotland and Northern England. Columba and Celtic 12 Apostles is a remarkable story. I could have voted for Kateri and felt perfectly good about it. I always have mixed feelings about the conversion of indigenous peoples, and certainly she suffered losses because of it, though she remained faithful to her Lord. However, I cannot turn my back on a fellow book-lover! Columba, I would have coveted that psalter myself! And, of course, his recognition of his life having taken a wrong turn and his self-imposed penance aren’t lightly dismissed, especially during Lent. I voted for Columba, not because he is one of my favorite Irish Saints but because he exiled himself as penance for his warring ways. This season of Lent is all about Penance. I honor that in this season. Kudos to the SEC for a challenging matchup. While Kateri’s story is compelling, my Scotch-Irish roots are strong. First call was to a church on Staten Island that was founded by Scots (very strong willed people). Iona has influenced me from afar and someday I will get there. Booklover, check. But the clincher? First copyright dispute -since that’s where hubby’s career has been for years. Go Columba! Iona of my heart, Iona of my love . . . . Columba for me! I voted for Kateri because she lived near where I lived as a child. I lived in Chateuguay, Quebec, which is right next to Caughnawauga, the reservation that Kateri lived on south of Montreal. I’ve been to the magic isle of Iona (and that’s not so easy, two separate boat rides and one long bus ride in between), Columba must have really been amazing that so many followed him (and they didn’t have the advantage of the comfy bus and boats to get there) Have to go with Columba. I work at Iona College – pass St. Columba’s statue daily. Kind of a no brainer for me… Love LentMadness!!! I visited the island of Iona while in Scotland two years ago, and with my Celtic ancestry, I was tempted to vote for St. Columba, but St. Kateri is my neighbor (so to speak–her shrine in Auriesville is about 100 miles away), and I am impressed by her gentle nature, so I voted for her. A note: when I was in Tucson, Arizona, a few years ago, I re-visited the church of San Xavier del Bac, south of Tucson. This is an old church built by missionaries to the First People there. They had a statue of her in the church, put up some years ago, because she is seen as a saint for all First People, not just the Mohawks. The original plaque identified the statue as “Blessed” and this had been changed to “Saint” when she was made a saint. I voted for Columba. I hadn’t known of Columba’s violent earlier life, but it seems he repented and recommitted his life to the Gospel. Founding a monastery in Iona was a wonderful gift to the Church. I have been to that beautiful isle which is truly, as the Celts say, a “thin place.” Surrounded by the splendor of earth and sea and sky and sustained by the prayer that has been going on there for 1500 years, one does indeed experience a great closeness to God, as no doubt the saint himself did. I voted for Columba, as his lifelong dedication to books struck a chord with me. I would not be who I am if not for the riches of the written world. I love the first nations feel of Kateri, but her “interaction quotient” is low, in my book. I had never heard of Kateri before and was moved by her story. A bit heavy on the Roman Catholic emphasis, but I’m glad someone took her in and nurtured her faith. I still have to vote for Columba and his island community Iona, His legacy continues to benefit Christians of all types. If he can convert Nessie he has my vote! Columba all the way. I went with Colomba. Anybody who rebels against the institutional church gets my vote. Okay, so he shouldn’t have started a war over it but if we start discounting everyone in the early church or middle ages who started a senseless war, we’d take out a large chunk of the saintly population. And as many have already pointed out, he repented. I remember when Kateri was canonized and unfortunately I’ve never been able to get excited about her. Ah, me Irish brethern. Sorry, I just had to laugh at this bio. Did anyone else hear the Pogues singing in the background? Maybe their Christmas hit where everyone loves each other until they’ve had a few drinks? I actually thought I was going to vote for Kateri, but had to go for Columba after reading that outrageous bio. I must agree. That was one of the worst bios of a famous saint that I’ve read here. I just wish everyone had the time to read Adomnan’s bio of Columba. I think we’d get a much better and more balanced pic of the Celtic Saint. I felt it was a bit inappropriate to suggest a person was a candidate for sainthood because of some physical problem, despite the fact that scarring from her disease was certainly severe to cause visual impairment. I suspect we all know a number of fine Christian people who soldier on despite physical problems of various kinds, and nobody singles them out for distinction. There’s no question that the lady was a remarkable individual, but saints require a bit more. Millions of people die young. Should we designate them as saints because they might have done great things, had they lived? Columba, like so many of us, did some profoundly unacceptable things, but then he did what few ever do — he posed for himself severe consequences, and he did not waver from these. And, like Joseph (the REAL Joseph), he was able to take something very evil and turn it to something very good. Because of his deadly quarrels, he ended up converting many to a more civilized form of life. Ok, I would have voted for Columba, however, if he was such a good Christian, then why was he coveting a copy of a book? It should have been enough that he had access to it and was allowed to read it. On the other hand, our native American daughter sought out Christianity. I look at it this way, Columba had everything and wasted it. Kateri had nothing but gained everything. Such a fine Christian (his “boss”) forbade someone from having a copy of Scripture? I have worked with children with disfiguring skin conditions like neurofibratosis and Sturge-Weber, so I was moved by Kateri’s lot in life and what she must have endured. I admired her piety, her continual prayer for conversion of her people, and the development of a community of sisterhood of faith, all accomplished in a very short lifetime. I did not want to vote for that brawling book-loving Irishman. I’m married to one, except for the brawling part. And nuts to “converting” an imaginary beast. My grandfather was born on Colonsay/Oronsay, named for saints Columba and his companion Oron. Their first priory was built on Oransay, which is one island with Colonsay at low tide. A farm on Oransay was in my father’s family until the mid-20th century. Not sure who owns the land now, but each custodian works to preserve the ruins as best they can. A tiny mention of Oronsay would not detract from the eminence of Iona. Having visited Iona and loving all things Scottish, I had to vote for Columba. I do have admiration for Kateri, however. Both admirable contestants. Columba and I belong to the same clan in Ireland- I’ve got to support family! Both are worthy candidates. On balance, I voted for Columba because he founded the first monastic community on Iona and I’ve made great use of worship materials produced by the later Iona Community. The island of Iona is a beautiful place and still contributes to spiritual life of many. There are retreats and pilgrimages still occurring there–a long history. I have Scottish roots and Columba brought Christianity to Scotland. Columba gets my vote. I came in intending to vote for Kateri, but was swayed by Columba’s repentance and that he recognized that even while apparently serving God, he was moving in the wrong direction and creating chaos. Being a book lover doesn’t hurt his case either. Columba illustrates a theme–the repentant warrior–that is quite appealing, but for me this is trumped by learning that Takekwitha is a saint receiving the devotion of today’s warrior. In the interests of full discolsure, I did not learn that till after I voted, but so often today’s repentance (at least in the context of US politics) is cheap or bogus counted against the truly saintly (i. e. human and complex) nature of the bibliophile monk. As a librarian of Celtic descent, Columba had me at book lover and copyright dispute. I had to vote for Kateri as a person of peace. Ní mór dom vótáil ar son an tÉireannach. Níl aon rogha. Columa for me. Seems like he spread the faith over Scotland after he realized that fighting and killing were not so good. Kateri, saint from the New World, gets my vote today. I voted for Kateri. Originally I thought I’d vote for Columba, but anyone who would sacrifice lives over a beautiful book obviously needs his priorities evaluated. I’m sorry , Saints. I am NOT one but I wasn’t stongly pulled by either of you for a vote. Not wanting to abstain, however, I voted strictly on non-holy criteria. Columba… because he loved reading and writing and books, because he was a Celt and I have Irish roots, and because there is a St Columba church about 20 miles outside of place I live. Sorry, Kateri, I think you ran away and hid because of your disfiguration and others response to it. Had you stayed put and fought bullying you would have had my vote. Columba for sure. How could you not, he converted the lock ness monster. Columba was indeed a hot-head and a product of his times, but he turned himself around and repented. Then he applied that vigor and energy to peaceful goals. Iona, a place of peace, is still with us today. He would be a fitting patron for today’s militaristic governments and vengeful militias. Having taught Sunday School at St.Columba’s Church in Detroit, MI, as a teen-ager, I vote for Columba. I didn’t know much about him then, so am glad to read now about his being in Iona and in Scotland. I have both Irish & Scottish bloodlines but my vote went to Kateri. Many years before Kateri’s beatification she appeared to my cousin, in a dream, when my cousin was in a very bad place in her life. She told her many things and encouraged her to stay strong In her faith. My cousin had no idea who the woman was until, many years later, her picture appeared in the newspaper when she was beatified. Not the most compelling of match ups- I have always had a life long love of books! I am touched by Tekakwitha’s story but voted for Columba on account of his work as a scribe & missionary, and his courage in renouncing his violent tendencies. Kateri all the way. For a woman to have such faith and courage in a time when the “New World” was all about men, she is, for me, a shining star and someone to admire–she was bullied for her looks; cast out of her family, and yet, she was sustained by her faith and brought other women along on the journey with her. There is an organization that raises funds to help education indigenous Guatemalan women who might otherwise not get much of an education at all. I have met some of these women and heard the stories of how their education has changed their lives. This organization is named in honor of Kateri Tekakwitha. I can’t help but vote for her and the inspiration she has caused in others . . . I voted for Kateri because Katherine of Sienna is also my patron saint, but it was tough with all this Irish Catholic blood flowing in my veins! Columba, for having the spine to admit his wrongdoing and impose his own exile. I votes for Kateria, because even though she was partly blind she still did here study’s and worked. Columba is my favorite Saint of all time. I visited Iona briefly and fell in love with the uniqueness of the area. Then I heard the singers practicing and between the history and the beautiful music I was sold. I also like his running afoul of authority. Sorry, Kateri, but the church already has plenty of young-virgin saints. Your ethnicity is a plus, but I’m more inspired by women whose identity isn’t wrapped up in virginity. You retreated from life; Columba lived (not always wisely, but he grew – can’t see that you did much growing). So it’s Columba for me. In honer of my heritage and my gender I must vote for the Native Woman who’s story has touched me for several years. In her day it was not easy to pull off the things she did. The Episcopal church espouses diversity. Kateria Tekakwitha you get my vote. Thanks for this most excellent ditty! Do we have to do this till Easter?? Actually, you don’t have to do it even ’till tomorrow. But some of us will do to Holy Week. This is the toughest one for me yet. I come from a family that’s Scot. My grandmother always told me that was the heritage. She ended her life on St. Columba’s day, in a nursing home down the road from St. Columba’s Episcopal Church. However, Columba loved books so much he stole one, which makes me feel that I should vote the other way. Kateri is honoring my bicycling heritage. I just happened to be going past a shrine in New York state and stopped to visit, even before she was canonized. Even though no formal outlet was available, she still lived the life she felt God wanted her to lead (I, too, have run up against church politics.). Difficult, but no matter which way I vote, they’re both saints. The book-lover gets my vote. Any one who urges war is not a saint to me. I voted for Kateri, Lily of the Mohawks. Kateri. I’m partial to Native Americans, or 50 % Native American in her case, who were saintly. The Loch Ness bit about Columba makes the whole bio suspect. BTW, Kateri was 100% Native American…it’s just that her parents were from two different nations (Mohawk and Algonquin). CE and BCE are a little too PC for me even in a secular context, but really a bit offensive when one is writing Christian hagiography. Nonetheless Columba’s rejection of his fighting past and adoption of both scholarly and missionary zeal make him my clear choice today. Thank you, Powers of Lent Madness, for giving me a choice of two saints who are especially dear to my heart. No matter which saint wins today’s vote, I win. I’m glad to know Columba was such a book-lover! But Kateri gets my vote, as a Native American saint and particularly as patron of the environment and care for the earth, which is such an important cause in our time. I didn’t know she had chose Catherine of Siena as her baptismal saint! that’s another plus for me. Several people have commented that they are unimpressed with virgin saints; something to bear in mind is that “virgin” was for centuries the only category in which to put “woman who is not defined by her relationship with a man.” So it can be read as more feminist than you might think. Pretty sure that should have been “regarding religious life”. “Holy orders” is for clergy (ie priests), not religious (ie nuns). Historically, most communities of religious women (nuns) lived according to a rule that had been composed by men, so the fact that she and her sisters defined their own form of religious life was another plus for me. Not sure why chastity and virginity seem to be getting such a bad name among some of the comments…especially when embraced as a spiritual discipline and act of obedience by some of our Lent Madness saints. Probably by a large number of the modern day “saints” as well. Hmm. I voted for Columba. Exile and repentance/redemption, book lover, Iona, converting Scots and converting Nessie. Prayers for the students who lost their lives, their families and the university community. So torn today, but in the end my love for things Celtic and my ancestry won out. Just read Columba founded many, many more monasteries than just Iona, including Kells. If Leonard Cohen found her worthy then so do I ! Aside from that there stories are so different but also the same in suffering and faith. Two worthy saints but my vote and heart goes to Katerina.